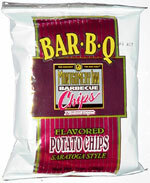 Taste test: These are unlike any other barbecue chips I've ever had. First, they're incredibly thick, with a great crunch. But even more noticeable is the amount of flavor powder on the chips  it's piled on thick, everywhere, like you wouldn't believe, and like I've never seen, giving them lots of great barbecue taste. Beyond that, some of the chips are huge, and they're all unbroken. Smell test: There's a nice, sweet barbecue sauce smell to these. Trivia: These chips have more flavor powder on them than any chips I've ever tasted. 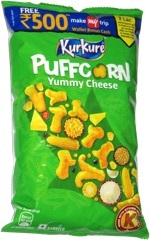 This snack was discovered at Snaxpo.